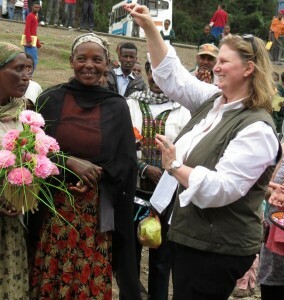 This month, we wanted to bring you a ‘postcard’ from Canadian Feed The Children supporter, Susan Weinert, who visited ISAPSO, one of our partners in Ethiopia. I read Susan’s report from her visit with great interest. 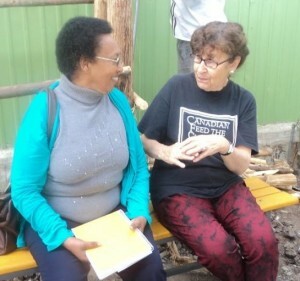 The powerful connection she felt with the women in the ISAPSO Self-Help Groups resonated with my own experience in April 2012 – we may have even been inspired by some of the same women! I’m delighted to share her messages from the heart with you in a special guest blog post. I hope you find it inspirational too! Here i am at right with ISAPSO Executive Director, Beletu Mengistu. Hello! My name is Susan Weinert. 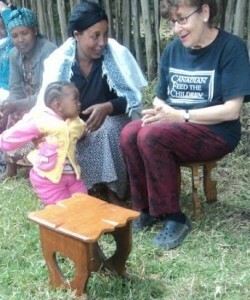 I’m a long-time advocate for children and women, and a CFTC supporter just like you. 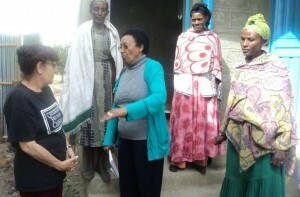 In November 2012, I had the good fortune to visit with women from three Self-Help Groups (SHGs) run by ISAPSO – a CFTC partner organization working in Chancho and Sululta Townships in Ethiopia. I saw first-hand the great impact that these groups are making to help women lift themselves and their children out of poverty, and heard directly from these women about the sense of empowerment they now feel. It was a deeply moving experience. I was particularly touched by the story of one woman who had received several sheep from the SHG which – unfortunately – had later been stolen. Her dilemma and the group’s response to it shed light on how my donation to these groups would be used to prompt change: real, meaningful, immediate change. Meeting with some of the SHG beneficiaries. The difference their mothers’ newfound confidence and prosperity makes in the lives of their children is what it’s all about! The women I spoke with went on to say that they would buy sheep as a group and perhaps pay two women in the group who are gifted in raising sheep to look after them. Their ingenuity in combining their collective talents to benefit the entire group, their problem-solving skills and understanding of how to manage their resources in a way that will be most effective for all of them, and their commitment to supporting and helping one another was truly inspirational. By investing in Self-Help Groups like these, we are doing much more than offering a one-time hand-out. We are offering a long-term plan for women to increase their income, enabling them to be more resilient and able to support each other if and when needed – whether it is stolen sheep, a child’s illness, a poor rainy season or one of any number of emergency situations that life puts in their way. And of course, we are also making access to these groups available to more women just like the ones I met – unleashing their power and potential across many more communities. It’s an investment that I was humbled and grateful to make in person – and that I hope you will join me in making today!